2006-03-09 Assigned to BIOCURE, INC. reassignment BIOCURE, INC. ASSIGNMENT OF ASSIGNORS INTEREST (SEE DOCUMENT FOR DETAILS). Assignors: ASFAW, BRUKTAWIT T., GOUPIL, DENNIS W.
A bone cement formed from a hydrogel formed by crosslinking a macromer having a polymeric backbone comprising units with a 1,2-diol or 1,3-diol structure and at least two pendant chains bearing crosslinkable groups and an amphiphilic comonomer. On occasion it becomes necessary to fix cancellous bone or osteoporotic bone, such as is found in the spine, with a prosthesis. For example, a spinal vertebrae may become damaged due to trauma or disease resulting in a collapse or misalignment of the vertebrae. Such a prosthesis should fill in degenerated cancellous bone and mechanically stabilize the vertebrae whose structural integrity may have been compromised by compression fractures. Preferably the prosthesis will be injectable and will mimic the characteristics and function of cancellous bone. This type of prosthesis is commonly called bone cement. The concept of treating vertebral fractures with a bone cement is a recognized clinical procedure. For the most part, polymethylmethacrylate (PMMA) has been the polymer of choice for percutaneous vertebroplasty. The use of PMMA to treat vertebral fractures is an extension of the use of PMMA in fixing total joint replacement prostheses such as total hip and total knee prostheses in place. PMMA has been modified by several manufacturers to address the recognized limitations of PMMA, including thermal necrosis due to exothermal curing (Dunne et al., Liu et al. ); chemical necrosis due to the release of unreacted monomer (Bettencourt et al. ); concentrated stresses originating from the mismatch between the mechanical properties of the bone and the cement and the residual stresses related to shrinkage during polymerization (Ahmed et al., Lennon et al., and Zor et al. ); and periprosthetic inflammatory response due to wear debris of bone cement (Tritschler et al., Ingraham et al.). The generation of heat to the surrounding tissue as PMMA bone cement cures is a matter of record. Polymerization temperatures range from 40° C. to 120° C. Huiskes showed that the interface temperature for PMMA bone cement could reach as high as 100-120° C. Meyer et al. found that the maximum temperature generated was 107° C. for a cement thickness of 10 mm and 60° C. for a thickness of 3 mm. Sih et al. showed that the maximum temperature decreased to 41° C. if the thickness was only 1 mm. Modifications that have been made to PMMA include the incorporation of bioactive fillers to improve the mechanical properties and increase the adhesion to bone (Shinzato et al. ); the development of novel formulations with higher ductility and lower tensile modulus to produce a more even stress distribution between a total joint replacement prosthesis and the bone (Harper et al. ); the modification of the liquid phase in order to decrease the thermal and chemical damage to tissue (Elvira et al. ); and the development of bone cements that contain a hydrogel-forming monomer, e.g. acrylic acid or 2-hydroxyethyl methacrylate, in order to adjust the mechanical and swelling properties of the bone cement system (Boesel et al., Pereira et al.). These modifications have been made to improve the function of bone cements for fixing a total joint replacement prosthesis to bone. Unfortunately, these modifications do not address the additional limitation of the mechanical mismatch between rigid PMMA-based bone cement and spongy osteoporototic cancellous bone. The stresses placed upon bone cement in the spine are generally compressive and much lower in magnitude than cement used in total joint replacement procedures (Villarraga et al.). These stresses in the vertebral body are estimated to be approximately 1 MPa or less (Villarraga et al. ), which is 10 times less than the tensile strength and 1,000 times less than the compressive modulus of commercial bone cements. WO 01/68721 to BioCure, Inc. discloses a composition useful for tissue bulking that is a hydrogel made from macromers having a backbone of a polymer having units with a 1,2-diol and/or 1,3-diol structure. Such polymers include poly(vinyl alcohol) (PVA) and hydrolyzed copolymers of vinyl acetate, for example, copolymers with vinyl chloride or N-vinylpyrrolidone. The backbone polymer contains pendant chains bearing crosslinkable groups and, optionally, other modifiers. The macromers form a hydrogel when crosslinked. This composition can be injected as a liquid and crosslinked into a solid hydrogel in situ. The composition taught in WO 01/68721 results in a hydrogel that is suitable for many bio-applications. However, a composition useful as a bone cement should ideally have particular properties not provided by the hydrogel taught in WO 01/68721. The invention relates to a bone cement used to fix fractures in bone, more particularly to a composition to treat porous bone such as osteoporotic bone. More specifically, the invention is a bone cement made from a composition including a crosslinkable macromonomer (also referred to herein as a macromer) and a comonomer that provides enhanced compressibility and integrity to the hydrogel. In one aspect, the invention is a bone cement that is made from a crosslinkable macromer and an amphiphilic comonomer. The crosslinkable macromer and amphiphilic comonomer form a hydrogel that has properties that are ideal for use as a bone cement. The bone cement can be used for fixation of either cancellous bone or osteoporotic bone, such as is found in the spine. The bone cement is preferably formed in situ. The invention is also a method for making a bone cement from a crosslinkable macromer and an amphiphilic comonomer. In a preferred embodiment, the bone cement is made in situ by injecting a liquid composition containing the crosslinkable macromer and amphiphilic comonomer into the bone and hardening the composition into a hydrogel. The method can involve either non-weight bearing bone or weight bearing bone, such as found in the spine. The bone cement formed in situ conforms in shape to the space into which it is injected. The bone cement has a compression modulus of approximately 1 to 60 mega pascals (MPa) at 10-60% strain, a yield load of approximately 4000-6000 Newtons, from about 100 to 130 MPa at failure strain, and has the ability to withstand cyclic loading under physiologic conditions. Furthermore, it may be advantageous for the bone cement to swell upon implantation to fill the fracture space. Additional potential design features include adhesion to the native tissue and recoil after compression, for example 100% after approximately 30 minutes of relaxation. The bone cement is made using macromers similar to those described in WO 01/68721. It has been discovered, however, that the addition of certain comonomers gives the hydrogel unexpected properties making it more suitable for use as a bone cement. The comonomers are described in detail below. The macromers have a backbone of a polymer comprising units with a 1,2-diol and/or 1,3-diol structure and at least two pendant chains including a crosslinkable group. The macromer backbone can optionally have other pendant chains containing modifiers. Polyvinyl alcohols (PVAs) that can be used as the macromer backbone include commercially available PVAs, for example Vinol® 107 from Air Products (MW 22,000 to 31,000, 98 to 98.8% hydrolyzed), Polysciences 4397 (MW 25,000, 98.5% hydrolyzed), BF 14 from Chan Chun, Elvanol® 90-50 from DuPont and UF-120 from Unitika. Other producers are, for example, Nippon Gohsei (Gohsenol®), Monsanto (Gelvatol®), Wacker (Polyviol®), Kuraray, Deriki, and Shin-Etsu. In some cases it is advantageous to use Mowiol® products from Hoechst, in particular those of the 3-83, 4-88, 4-98, 6-88, 6-98, 8-88, 8-98, 10-98, 20-98, 26-88, and 40-88 types. It is also possible to use copolymers of hydrolyzed or partially hydrolyzed vinyl acetate, which are obtainable, for example, as hydrolyzed ethylene-vinyl acetate (EVA), or vinyl chloride-vinyl acetate, N-vinylpyrrolidone-vinyl acetate, and maleic anhydride-vinyl acetate. If the macromer backbones are, for example, copolymers of vinyl acetate and vinylpyrrolidone, it is again possible to use commercially available copolymers, for example the commercial products available under the name Luviskole® from BASF. Particular examples are Luviskol VA 37 HM, Luviskol VA 37 E and Luviskol VA 28. If the macromer backbones are polyvinyl acetates, Mowilith 30 from Hoechst is particularly suitable. The PVA preferably has a molecular weight of at least about 2,000. As an upper limit, the PVA may have a molecular weight of up to 300,000. Preferably, the PVA has a molecular weight of up to about 130,000, more preferably up to about 60,000, and especially preferably of about 14,000. The PVA usually has a poly(2-hydroxy)ethylene structure. The PVA may also include hydroxy groups in the form of 1,2-glycols. The PVA can be a fully hydrolyzed PVA, with all repeating groups being—CH2—CH(OH), or a partially hydrolyzed PVA with varying proportions (1% to 25%) of pendant ester groups. PVA with pendant ester groups have repeating groups of the structure CH2—CH(OR) where R is COCH3 group or longer alkyls, as long as the water solubility of the PVA is preserved. The ester groups can also be substituted by acetaldehyde or butyraldehyde acetals that impart a certain degree of hydrophobicity and strength to the PVA. For an application that requires an oxidatively stable PVA, the commercially available PVA can be broken down by NaIO4—KMnO4 oxidation to yield a small molecular weight (2000 to 4000) PVA. The PVA is prepared by basic or acidic, partial or virtually complete, hydrolysis of polyvinyl acetate. In a preferred embodiment, the PVA comprises less than 50% acetate units, especially less than about 25% of acetate units. Preferred amounts of residual acetate units in the PVA, based on the sum of alcohol units and acetate units, are approximately from 3 to 25%. The macromers have at least two pendant chains containing groups that can be crosslinked. Group is defined herein to include single polymerizable moieties, such as acrylates, as well as larger crosslinkable regions, such as oligomeric or polymeric regions. The crosslinkers are desirably present in an amount of from approximately 0.01 to 10 milliequivalents of crosslinker per gram of backbone (meq/g), more desirably about 0.05 to 1.5 milliequivalents per gram (meq/g). The macromers can contain more than one type of crosslinkable group. The pendant chains are attached via the hydroxyl groups of the backbone. Desirably, the pendant chains having crosslinkable groups are attached via cyclic acetal linkages to the 1,2-diol or 1,3-diol hydroxyl groups. Desirable crosslinkable groups include (meth)acrylamide, (meth)acrylate, styryl, vinyl ester, vinyl ketone, vinyl ethers, etc. Particularly desirable are ethylenically unsaturated functional groups. A particularly desirable crosslinker is N-acryloyl-aminoacetaldehyde dimethylacetal (NAAADA) in an amount from about 6 to 21 crosslinkers per macromer. Specific macromers that are suitable for use in the compositions are disclosed in U.S. Pat. Nos. 5,508,317, 5,665,840, 5,807,927, 5,849,841, 5,932,674, 5,939,489, and 6,011,077.
in which R is a linear or branched C1-C8 alkylene or a linear or branched C1-C12 alkane. Suitable alkylene examples include octylene, hexylene, pentylene, butylene, propylene, ethylene, methylene, 2-propylene, 2-butylene and 3-pentylene. Preferably lower alkylene R has up to 6 and especially preferably up to 4 carbon atoms. The groups ethylene and butylene are especially preferred. Alkanes include, in particular, methane, ethane, n- or isopropane, n-, sec- or tert-butane, n- or isopentane, hexane, heptane, or octane. Preferred groups contain one to four carbon atoms, in particular one carbon atom. R1 is hydrogen, a C1-C6 alkyl, or a cycloalkyl, for example, methyl, ethyl, propyl or butyl and R2 is hydrogen or a C1-C6 alkyl, for example, methyl, ethyl, propyl or butyl. R1 and R2 are preferably each hydrogen. R6 and R7, independently of one another, are hydrogen, a linear or branched C1-C8 alkyl, aryl or cyclohexyl, for example one of the following: octyl, hexyl, pentyl, butyl, propyl, ethyl, methyl, 2-propyl, 2-butyl or 3-pentyl. R6 is preferably hydrogen or the CH3 group, and R7 is preferably a C1-C4 alkyl group. R6 and R7 as aryl are preferably phenyl. In another embodiment, R3 is an olefinically unsaturated acyl group of formula R8-CO—, in which R8 is an olefinically unsaturated copolymerizable group having from 2 to 24 carbon atoms, preferably from 2 to 8 carbon atoms, especially preferably from 2 to 4 carbon atoms. The olefinically unsaturated copolymerizable radical R8 having from 2 to 24 carbon atoms is preferably alkenyl having from 2 to 24 carbon atoms, especially alkenyl having from 2 to 8 carbon atoms and especially preferably alkenyl having from 2 to 4 carbon atoms, for example ethenyl, 2-propenyl, 3-propenyl, 2-butenyl, hexenyl, octenyl or dodecenyl. The groups ethenyl and 2-propenyl are preferred, so that the group -CO-R8 is the acyl radical of acrylic or methacrylic acid. R9 and R10 are each independently lower alkylene having from 2 to 8 carbon atoms, arylene having from 6 to 12 carbon atoms, a saturated divalent cycloaliphatic group having from 6 to 10 carbon atoms, arylenealkylene or alkylenearylene having from 7 to 14 carbon atoms or arylenealkylenearylene having from 13 to 16 carbon atoms, and R8 is as defined above. Lower alkylene R9 or R10 preferably has from 2 to 6 carbon atoms and is especially straight-chained. Suitable examples include propylene, butylene, hexylene, dimethylethylene and, especially preferably, ethylene. Arylene R9 or R10 is preferably phenylene that is unsubstituted or is substituted by lower alkyl or lower alkoxy, especially 1,3-phenylene or 1,4-phenylene or methyl-1,4-phenylene. A saturated divalent cycloaliphatic group R9 or R10 is preferably cyclohexylene or cyclohexylene-lower alkylene, for example cyclohexylenemethylene, that is unsubstituted or is substituted by one or more methyl groups, such as, for example, trimethylcyclohexylenemethylene, for example the divalent isophorone radical. The arylene unit of alkylenearylene or arylenealkylene R9 or R10 is preferably phenylene, unsubstituted or substituted by lower alkyl or lower alkoxy, and the alkylene unit thereof is preferably lower alkylene, such as methylene or ethylene, especially methylene. Such radicals R9 or R10 are therefore preferably phenylenemethylene or methylenephenylene. Arylenealkylenearylene R9 or R10 is preferably phenylene-lower alkylene-phenylene having up to 4 carbon atoms in the alkylene unit, for example phenyleneethylenephenylene. The groups R9 and R10 are each independently preferably lower alkylene having from 2 to 6 carbon atoms, phenylene, unsubstituted or substituted by lower alkyl, cyclohexylene or cyclohexylene-lower alkylene, unsubstituted or substituted by lower alkyl, phenylene-lower alkylene, lower alkylene-phenylene or phenylene-lower alkylene-phenylene. 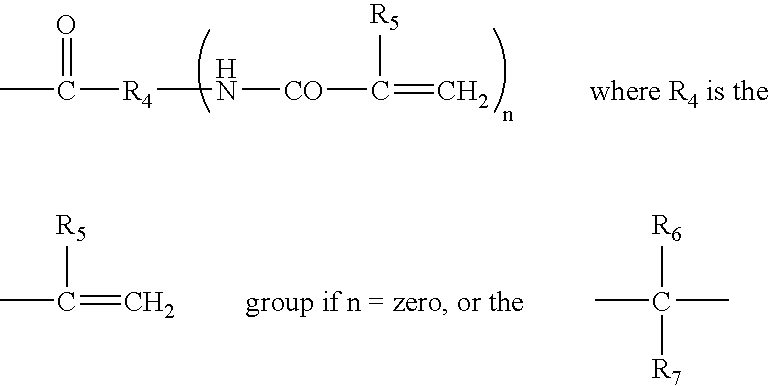 The group —R9 —NH—CO—O —is present when q is one and absent when q is zero. Macromers in which q is zero are preferred. The group —CO—NH—(R9—NH—CO—O)q—R10—O —is present when p is one and absent when p is zero. Macromers in which p is zero are preferred. In macromers in which p is one, q is preferably zero. Macromers in which p is one, q is zero, and R10 is lower alkylene are especially preferred. All of the above groups can be monosubstituted or polysubstituted, examples of suitable substituents being the following: C1-C4 alkyl, such as methyl, ethyl or propyl, —COOH, —OH, —SH, C1-C4 alkoxy (such as methoxy, ethoxy, propoxy, butoxy, or isobutoxy), —NO2, —NH2, —NH(C1-C4), —NH—CO—NH2, —N(C1-C4 alkyl)2, phenyl (unsubstituted or substituted by, for example, -OH or halogen, such as Cl, Br or especially I), —S(C1-C4 alkyl), a 5- or 6-membered heterocyclic ring, such as, in particular, indole or imidazole, —NH—C(NH)—NH2, phenoxyphenyl (unsubstituted or substituted by, for example, -OH or halogen, such as Cl, Br or especially I), an olefinic group, such as ethylene or vinyl, and CO—NH—C(NH)—NH2. Preferred substituents are lower alkyl, which here, as elsewhere in this description, is preferably C1-C4 allyl, C1-C4 alkoxy, COOH, SH, —NH2, —NH(C1-C4 alkyl), —N(C1-C4 alkyl)2 or halogen. Particular preference is given to C1-C4 alkyl, C1-C4 alkoxy, COOH and SH. For the purposes of this invention, cycloalkyl is, in particular, cycloalkyl, and aryl is, in particular, phenyl, unsubstituted or substituted as described above. A particularly preferred macromer has a PVA backbone (14 kDa, 17% acetate incorporation) modified with 1.07 meq/g N-acrylamidoacetaldehyde dimethyl acetal (NAAADA) pendant polymerizable groups (about 15 crosslinks per chain). In some preferred embodiments the PVA backbone is also modified with a hydrophobic modifier acetaldehyde diethyl acetal (AADA) present in an amount from about 0 to 4 milliequivalents per grain (meq/g) of PVA (as discussed further below). WO 01/68721 describes the addition of comonomers that are hydrophilic or hydrophobic to change the characteristics of the hydrogel. Surprisingly, it has been found that the inclusion of amphiphilic comonomers adds the qualities needed to make the hydrogel suitable for spinal disc nucleus replacement. As used herein, the term amphiphilic means that one portion of the molecule is hydrophilic and one portion of the molecule is hydrophobic. In one embodiment, the hydrophilic portion is water soluble and the hydrophobic portion is not water soluble. The monomer as a whole is preferably wholly or partially water soluble. Examples of useful amphiphilic comonomers are diacetone acrylamide (DAA), N-vinyl caprolactam, N-(butoxymethyl)acrylamide, N-acroyl morpholine, crotonamide, N,N-dimethyl acrylamide, N-octadecylacrylamide, and acrylamide. When the amphiphilic comonomers are copolymerized with the macromers described above, a hydrogel results that is more cohesive and has higher compressive strength than a hydrogel not containing the amphiphilic comonomer. Desirably, the comonomer is included in an amount ranging from about 5 to 95 weight percent, most preferably about 40-60 weight percent (where weight percent is the percent by weight of the total solution). The ethylenically unsaturated groups of the macromer and comonomer can be crosslinked via free radical initiated polymerization, including with initiation via photoinitiation, redox initiation, and thermal initiation. Systems employing these means of initiation are well known to those skilled in the art and may be used in the compositions taught herein. The desired amounts of the initiator components will be determined by concerns related to gelation speed, toxicity, extent of gelation desired, and stability. In one embodiment, a two part redox system is employed. One part of the system contains a reducing agent. Examples of reducing agents are ferrous salts (such as ferrous gluconate dihydrate, ferrous lactate dihydrate, or ferrous acetate), cuprous salts, cerous salts, cobaltous salts, permanganate, manganous salts, and tertiary amines such as N,N,N,N-tetramethylethylene diamine (TMEDA). The other half of the solution contains an oxidizing agent such as hydrogen peroxide, t-butyl hydroperoxide, t-butyl peroxide, benzoyl peroxide, cumyl peroxide, potassium persulfate, or ammonium persulfate. Either or both of the redox solutions can contain macromer, or it may be in a third solution. The solutions containing reductant and oxidant are combined to initiate the crosslinking. It may be desirable to use a coreductant such as ascorbate, for example, to recycle the reductant and reduce the amount needed. This can reduce the toxicity of a ferrous based system. Thermal initiation can be accomplished using ammonium persulfate as the crosslinking initiator and optionally using N,N,N,N-tetramethylethylene diamine (TMEDA), which is an amine accelerator. The macromers can include further modifier groups and crosslinkable groups. Some such groups are described in U.S. Pat. Nos. 5,508,317, 5,665,840, 5,807,927, 5,849,841, 5,932,674, 5,939,489, and 6,011,077 and include hydrophobic modifiers such as acetaldehyde diethyl acetal (AADA), butyraldehyde, and acetaldehyde or hydrophilic modifiers such as N-(2,2-dimethoxy-ethyl) succinamic acid, amino acetaldehyde dimethyl acetal, and aminobutyraldehyde dimethyl acetal. These groups may be attached to the macromer backbone, or to other monomeric units included in the backbone. Crosslinkable groups and optional modifier groups can be bonded to the macromer backbone in various ways, for example through a certain percentage of the 1,3-diol units being modified to give a 1,3-dioxane, which contains a crosslinkable group, or a further modifier, in the 2-position. Modifiers include those to modify the hydrophobicity or hydrophilicity, active agents or groups to allow attachment of active agents, photoinitiators, modifiers to enhance or reduce adhesiveness, modifiers to impart thermoresponsiveness, modifiers to impart other types of responsiveness, and additional crosslinking groups. Attaching a cellular adhesion promoter to the macromers can enhance cellular attachment or adhesiveness of the composition. These agents are well known to those skilled in the art and include carboxymethyl dextran, proteoglycans, collagen, gelatin, glucosaminoglycans, fibronectin, lectins, polycations, and natural or synthetic biological cell adhesion agents such as RGD peptides. Having pendant ester groups that are substituted by acetaldehyde or butyraldehyde acetals, for example, can increase the hydrophobicity of the macromers and the formed hydrogel. One particularly useful hydrophobic modifying group is acetaldehyde diethyl acetal (AADA) present in an amount from about 0 to 4 milliequivalents per gram (meq/g) of PVA. Hydrophilic modifiers such as —COOH in the form of N-(2,2-dimethoxy-ethyl) succinamic acid in an amount from about 0 to 2 meq/g PVA can be added to the composition to enhance performance of the composition, such as swelling. It may also be desirable to include on the macromer a molecule that allows visualization of the formed hydrogel. Examples include dyes and molecules visualizable by magnetic resonance imaging. The prosthetic nucleus can be made containing a contrast agent. A contrast agent is a biocompatible material capable of being monitored by, for example, radiography. The contrast agent can be water soluble or water insoluble. Examples of water soluble contrast agents include metrizamide, iopamidol, iothalamate sodium, iodomide sodium, and meglumine. Iodinated liquid contrast agents include Omnipaque®, Visipaque®, and Hypaque-76®. Examples of water insoluble contrast agents are tantalum, tantalum oxide, barium sulfate, gold, tungsten, and platinum. These are commonly available as particles preferably having a size of about 10 μm or less. Coated-fibers, such as tantalum-coated Dacron fibers can also be used. The contrast agent is incorporated temporarily or permanently in the prosthetic implant. Both solid and liquid contrast agents can be simply mixed with a solution of the liquid composition prior to crosslinking of the macromers and comonomers. Liquid contrast agent can be mixed at a concentration of about 10 to 80 volume percent, more desirably about 20 to 50 volume percent. Solid contrast agents are desirably included in an amount of about 5 to 40 weight percent, more preferably about 5 to 20 weight percent. The prosthetic nucleus can include an effective amount of one or more biologically or structurally active agents. It may be desirable to deliver the active agent from the formed hydrogel. Active agents that it may be desirable to deliver include prophylactic, therapeutic, diagnostic, and structural agents including organic and inorganic molecules and cells (collectively referred to herein as an “active agent” or “drug”). A wide variety of active agents can be incorporated into the hydrogel. Release of the incorporated additive from the hydrogel is achieved by diffusion of the agent from the hydrogel, degradation of the hydrogel, and/or degradation of a chemical link coupling the agent to the polymer. In this context, an “effective amount” refers to the amount of active agent required to obtain the desired effect. Examples of active agents that can be incorporated include, but are not limited to, analgesics for the treatment of pain, for example ibuprofen, acetaminophen, and acetylsalicylic acid; antibiotics for the treatment of infection, for example tetracyclines, gentamycin, and penicillin and derivatives; and additives for the treatment of infection, for example silver ions, silver (metallic), and copper (metallic). Cells and tissue can be incorporated into the composition, including stem cells, autologous nucleus pulposus cells, transplanted autologous nucleus pulposus cells, autologous tissue, fibroblast cells, chondrocyte cells, notochordal cells, allograft tissue and cells, and xenograft tissue and cells. It may be advantageous to incorporate material of biological origin or biological material derived from synthetic methods of manufacture such as proteins, polypeptides, polysaccharides, proteoglycans, and growth factors. It may be desirable to include additives to improve the swelling and space-filling properties of the prosthetic disc, for example, dehydrated spheres, fibers, etc., hydrophilic polymers, such AMPS, etc., or hydrocolloids, such as agar, alginates, carboxymethylcellulose, gelatin, guar gum, gum arabic, pectin, starch, and xanthum gum. Other additives that may prove advantageous are additives to improve the adhesive properties of the prosthetic disc, including positively charged polymers, such as Quat, etc., PVA modified with positive-charged moieties attached to the backbone, cyanoacrylates, PVA modified with cyanoacrylate moieties attached to the backbone, chitosan, and mussel-based adhesives. Incorporation of additives to improve the toughness properties of the injectable disc materials may prove desirable such as low modulus spheres, fibers, etc that act as “crack arrestors” and high modulus spheres, fibers, etc that act as “reinforcing” agents. Active agents can be incorporated into the composition simply by mixing the agent with the composition prior to administration. The active agent will then be entrapped in the hydrogel that is formed upon administration of the composition. The active agent can be in compound form or can be in the form of degradable or nondegradable nano or microspheres. It some cases, it may be possible and desirable to attach the active agent to the macromer. The active agent may be released from the macromer or hydrogel over time or in response to an environmental condition. It may be desirable to include a peroxide stabilizer in redox initiated systems. Examples of peroxide stabilizers are Dequest® products from Solutia Inc., such as for example Dequest(® 2010 and Dequest® 2060S. These are phosphonates and chelants that offer stabilization of peroxide systems. Dequest® 2060S is diethylenetriamine penta(methylene phosphonic acid). These can be added in amounts as recommended by the manufacturer. To use the bone cement, a liquid composition is prepared by mixing the amphiphilic comonomer, the macromer, and any other components such as a crosslinking initiator, in the desired concentrations for each and proportion to each other. The composition may be prepared as a two-part composition, which form the hydrogel when mixed together. The macromer and comonomer are crosslinked into the bone cement in situ. After creation of a space in the bone, if desired, an effective amount of the liquid composition is placed into the bone—preferably by a minimally invasive method. The term “effective amount”, as used herein, means the quantity of composition needed to fill the bone cavity. The composition may be administered over a number of treatment sessions. In the preferred method of using the bone cement, the liquid composition is drawn up in a 10 ml Luer-lok syringe with care being taken to expel any air bubbles and then delivered using a needle of about 18 Gauge through the bone access port into the bone cavity under fluoroscopic guidance until the bone cavity has been filled to the desired level. In the case of a two-part composition, the composition is mixed prior to injection in a syringe or using a dual syringe method—transferring the mixture back and forth between two 5ml syringes using a three way stopcock with care being taken to avoid air bubbles. The composition will preferably crosslink into the formed hydrogel within 5 to 15 minutes post mixing. The viscosity of the composition is, within wide limits, not critical, but the solution should preferably be a flowable solution that can be delivered through an appropriately sized catheter or syringe needle. For delivery through a microcatheter, a viscosity in the range of about 10 to 50 cp is desirable. The viscosity can be substantially higher for delivery through a syringe needle, such as, for example 20 to 300 cp without mechanical assistance or 100 to 500 cp with mechanical assistance. The viscosity will generally be controlled by the molecular weight of the macromers, the solids content of the solution, and the type and amount of contrast agent present (if any). The solids content of the solution will preferably range from about 2 percent by weight to about 30 percent by weight, desirably from about 6 to 12 percent by weight. In the preferred embodiment, the composition should be injected before substantial crosslinking of the macromers has occurred. This procedure prevents blockage of the syringe needle or catheter with gelled polymer. In addition, in situ crosslinking may allow anchoring of the hydrogel to host tissue by covalently bonding with collagen molecules present within the host tissue. The examples below serve to further illustrate the invention, to provide those of ordinary skill in the art with a complete disclosure and description of how the compounds, compositions, articles, devices, and/or methods claimed herein are made and evaluated, and are not intended to limit the scope of the invention. In the examples, unless expressly stated otherwise, amounts and percentages are by weight, temperature is in degrees Celsius or is at ambient temperature, and pressure is at or near atmospheric. PVA (mw=14,000) was modified with 0.45 mmol/g of N-acryloyl-aminoacetaldehyde dimethylacetal (NAAADA) as crosslinker (6.3×l/chain). 10 g of a 20% (w/w) modified-PVA solution in water was mixed with 1 g of a 10% (w/w) solution of ammonium persulfate and then added to one barrel of a dual syringe applicator fitted with a 2 cm long mixing tip. Separately, 10 g of a 20% (w/w) aqueous modified-PVA solution was mixed with 50 μl of N,N,N,N-tetramethylethylene diamine (TMEDA) then placed in the second barrel of the dual syringe applicator. The mixture was injected into a disc mold wherein a polymer was quickly formed in about 20 seconds at room temperature. The disc was transparent, soft, and compressible but brittle. PVA (mw=14,000) was modified with 0.86 mmol/g of N-acryloyl-aminoacetaldehyde dimethylacetal (NAAADA) as crosslinker (12×l/chain), and 3.0 mmol/g of acetaldehyde diethyl acetal (AADA). 20 g of comonomer diacetone acrylamide (DAA) was slowly dissolved in 20 g of a 24% (w/w) PVA solution. 50 mg of ammonium persulfate was dissolved in 5 g of the resulting solution. 20 μl TMEDA was added and mixed for 20 seconds, then delivered into a disc mold. The resulting hydrogel was opaque-white and had a yield load of 4429 N.
PVA (mw=14,000) was modified with 1.07 mmol/g of N-acryloyl-aminoacetaldehyde dimethylacetal (NAAADA) as crosslinker (15×l/chain), and 2.7 mmol/g of acetaldehyde diethyl acetal (AADA). 20 g of comonomer diacetone acrylamide (DAA) was slowly dissolved in 20 g of a 24% (w/w) PVA solution. 50 mg of ammonium persulfate was dissolved in 5 g of the resulting solution. 20 μl TMEDA was added and mixed for 20 seconds, then delivered into a disc mold. The resulting hydrogel was opaque-white and had a yield load of 4811 N.
PVA (mw=14,000) was modified with 1.07 mmol/g of N-acryloyl-aminoacetaldehyde dimethylacetal (NAAADA) as crosslinker (15×l/chain), and 2.7 mmol/g of acetaldehyde diethyl acetal (AADA). 20 g of comonomer diacetone acrylamide (DAA) was slowly dissolved in 20 g of a 24% (w/w) PVA solution. A 10% solution of ammonium persulfate was added to the resulting solution. 20 μl TMEDA was added and mixed for 20 seconds, then delivered into a disc mold. The resulting hydrogel was opaque-white and had a yield load of 6026 N.
PVA (mw=14,000) was modified with 1.07 mmol/g of N-acryloyl-aminoacetaldehyde dimethylacetal (NAAADA) as crosslinker (15×l/chain), 2.7 mmol/g of acetaldehyde diethyl acetal (AADA), and 0.5 mmol/g of aminoacetaldehydediethyl acetal. 20 g of comonomer DAA was slowly dissolved in 20 g of a 24% (w/w) PVA solution. 25 mg of ammonium persulfate was dissolved in 5 g of the resulting solution. 20 μl TMEDA was added and mixed for 20 seconds, then delivered into a disc mold. The resulting hydrogel was slightly opaque and had a yield load of 4600 N.
The following chart compares the effect of comonomer concentration on yield load. The comonomer was diacetone acrylamide (DAA). The Young's modulus of cancellous bone is approximately 100 MPa and may decrease to about 1 MPa or less for osteoporotic bone. The following chart shows the compressive modulus in megapascals (MPa) as a percentage of strain for several candidate formulations of modified PVA hydrogels. Modifications and variations of the present invention will be apparent to those skilled in the art from the forgoing detailed description. All modifications and variations are intended to be encompassed by the following claims. All publications, patents, and patent applications cited herein are hereby incorporated by reference in their entirety. 1. An injectable bone cement comprising a hydrogel formed from a macromer having a polymeric backbone comprising units with a 1,2-diol or 1,3-diol structure and at least two pendant chains bearing crosslinkable groups and an amphiphilic comonomer. 2. The bone cement of claim 1, wherein the hydrogel has takes the shape of the void created by the fracture or spinal tumor. 3. The bone cement of claim 1, wherein the hydrogel has a yield load between about 4000 to 6000 Newtons. 4. The bone cement of claim 1, wherein the hydrogel has a compression modulus from about 1 to 60 mega pascals (MPa) at 10-60% strain, and from about 100 to 130 MPa at failure strain. 5. 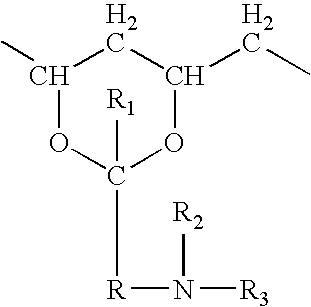 The bone cement of claim 1, wherein the comonomer is selected from the group consisting of diacetone acrylamide (DAA), N-vinyl caprolactam, N-(butoxymethyl)acrylamide, N-acroyl morpholine, crotonamide, N,N-dimethyl acrylamide, N-octadecylacrylamide, and acrylamide. 6. The bone cement of claim 1, wherein the comonomer is DAA at a concentration between about 40-60% by weight. 7. The bone cement of claim 1, wherein the macromer has a poly(vinyl alcohol) backbone having a molecular weight of about 14,000 and the pendant chains bearing crosslinkable groups are N-acrylamidoacetaldehyde dimethyl acetal (NAAADA) in an amount of about 6 to 21 crosslinkers per PVA. 8. The bone cement of claim 1, wherein the PVA backbone further is modified with a hydrophobic or hydrophilic modifier. 9. The bone cement of claim 8, wherein the hydrophobic modifier is acetaldehyde diethyl acetal (AADA) present in an amount from about 0 to 4 milliequivalents per gram (meq/g) of PVA. 10. A method for fixing a fracture with a bone cement comprising implanting into the bone cavity a hydrogel formed from a macromer having a polymeric backbone comprising units with a 1,2-diol or 1,3-diol structure and at least two pendant chains bearing crosslinkable groups and an amphiphilic comonomer. 11. The method of claim 10, wherein the bone cement is formed in situ. 12. The method of claim 10, wherein the macromer and comonomer are combined in solution along with a free radical crosslinking initiator and injected into the bone cavity as a solution. 13. The method of claim 12, wherein the step of implanting comprises injecting the solution through the surrounding bone using a needle of about 18 Gauge. ES2268714T3 (en) 2007-03-16 Crosslinked compositions and methods polymers for use.